Every human being craves comfort. Webster’s defines comfort as a “strengthening aid”, or “consolation in time of trouble or worry”. The specific trouble or worry requiring consolation varies. I have recently relocated, and moved back to the area where I spent my teens and 20’s. I couldn’t wait to leave, and once gone, I couldn’t wait to come back. It’s a dilemma many share (my friend and fellow blogger often writes about this with tenderness and humor). I have discovered, having been “home” a mere six months, that comfort takes many forms: a familiar landmark, warm (hot?) 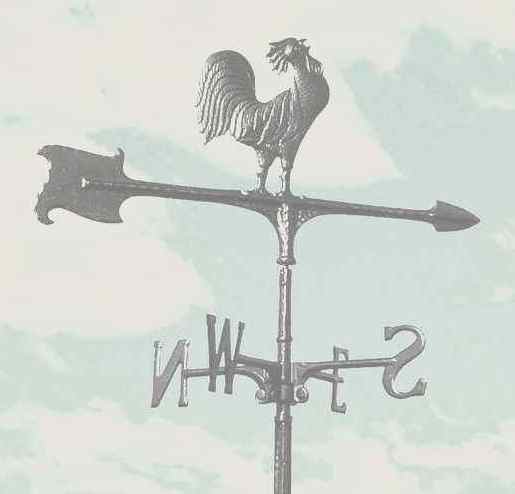 weather, sweet Southern accents, and, food. For those who are familiar with my laments on Twitter or this blog, or in real life, you know that my two ongoing themes these days are dating (groan) and good food (*groan*). I recently embarked on what I’m calling a “Recipe Adventure” (#recipeadventure on if you’re a Tweep). In times of stress, joy, sadness, fatigue, you name it – any time I need comfort – I turn to food first. Cooking and creating (or failing at , if you read my post about black rice pudding – a disaster) dishes makes me happy, relaxed, tranquil. Few things (pg-rated, at least) take me to such a place of calm, relaxation and peace. Food is my religion. Cookbooks are my bible. So, real life has become a bit crazed. The dating scene is stale (unless I were to become a lesbian, a gay man, a polygamist, or, again, a Cougar. <cough>). My day job is increasingly stressful – not exactly what I hoped for when I moved South of the Mason-Dixon. But the food scene… ah! It’s alive. It’s electric. And, it’s where I turn when I need comfort. So, in an effort to a. take my mind off of the facts (that I will have to soon stop shaving my legs, buy 13 cats and move in with my bestie, my job is turning me into a haggard shrew, and I still get lost in my new city), I cook. I eat. I read cookbooks. And, I have challenged myself to a regular Recipe Adventure. 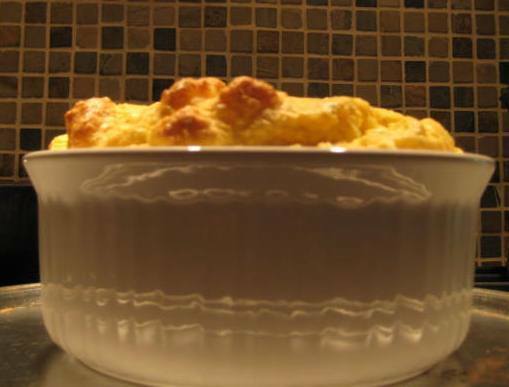 This week’s Recipe Adventure involved the recreation of Magnolia Grill’s Grits Souffle. I tried this while recently dining at the restaurant with friends. At the time, I was a non-believer. But, I have said, food is my religion. I think I experienced Ascension (and, no, I did not have a reservation on May 21, 2011 – he had the date wrong, anyway, fools) that night. And it began with this cheesy, creamy, decadent dish. My recreation of the recipe wasn’t as glamorous, or as beautifully plated. But, it brought me to a whole new state-of-being.. Nearly transcendental (what date can do *that*?!). For two hours, I was transported to a world of simmering Southern-ness. I even caught myself saying “y’all”. 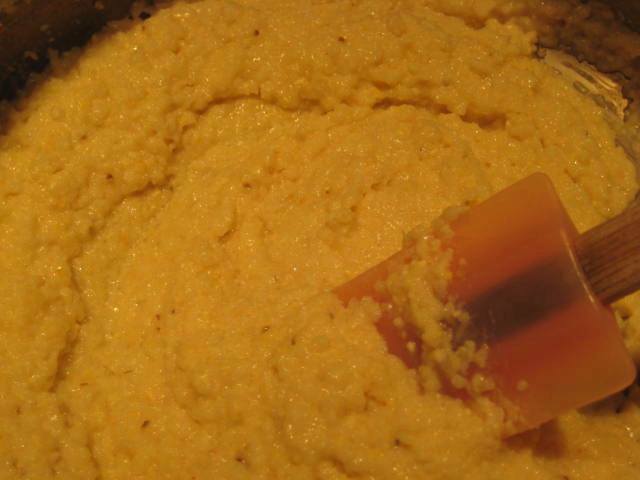 The process began with cooking the stoneground grits in a bath of half and half, chicken broth and water. In no time, it was creamy, freckled, beauty. Soon came the cheese. And the butter. And the garlic. And the chives (the recipe called for tabasco and green onion, I used salsa and fresh chives). And the Cabernet (no, not for the souffle. For me.). And when it was finished, I was a happy girl. My kitchen smelled like a Norman Rockwell print, my mouth was watering, and my heart danced – not just because I was filled with memories of the night I first tasted this dream, but because I recreated it, and in doing so, had created a little bit of comfort, and another Comfort Food to add to my arsenal. So, while things are as crazy, stressful, and laughable as ever, I feel rejuvenated. Re-prioritized. All because of the hours I spent in my little kitchen, with my gas stove (I could write an entire ode to this stove), my cuisinart, and my love for food. It really is the cure for what ails ya, and , I like to think, it’s my lust for the perfect recipe (ok, and a few other things) that keeps things hot. This entry was posted in Uncategorized and tagged Comfort Food, Grits, Magnolia Grill, Mason-Dixon, South, The Momma Hen, Twitter by raleighjustaddheat. Bookmark the permalink. I wonder, how would your perfectly soft, yet firm, souffle would taste if you used a nice shrimp / seafood stock. I for one know that shrimp-n-grits is one of those mouthgasmic experiences everyone needs to embrace at least once. *testify*Looking forward to your next #recipeadventure and being inspired to ascend to new heights of culinary pleasure. P.S. There is a shortage of perfectly shaved legs in the world. Would be a shame to ruin yours.